How can we afford to expand our urban footprint without enough tax payers to carry the burden? 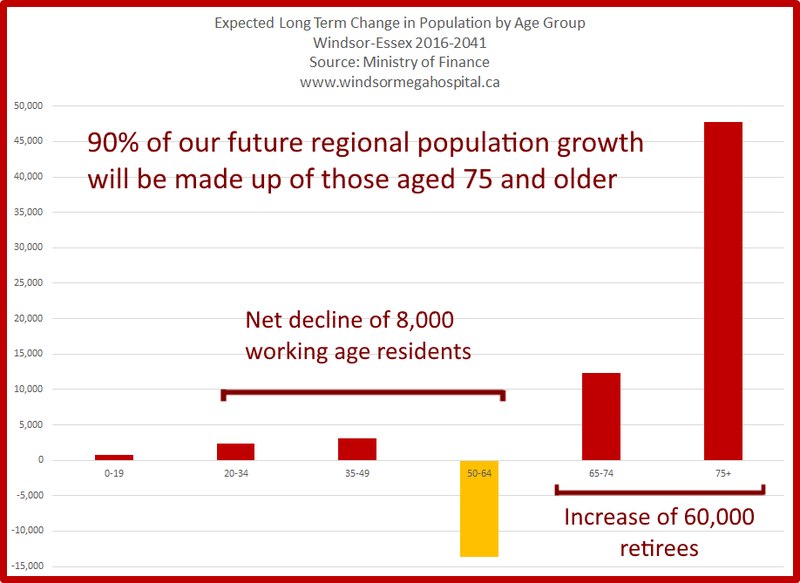 Ministry of Finance population projections tell us Windsor-Essex will grow by 60k residents through 2041. This increase is disproportionate: all the growth will be in the senior population, 90% of this figure comprising seniors aged 75 and above. All other age groups are expected to stagnate, while those aged 50-64 will shrink by about 15%. Furthermore, population projections in two important consultants' reports shaping our regional infrastructure planning are completely outdated. They show material discrepancies when compared with the more recent Ministry of Finance figures, as well as actual census data. In our previous analysis, we wrote about the disconnect between overall population data used today to forecast the region’s housing and road infrastructure needs, recent Ministry of Finance projections, as well as 2016 census data. Here, we’re looking at expected changes in the age groups of our regional population. 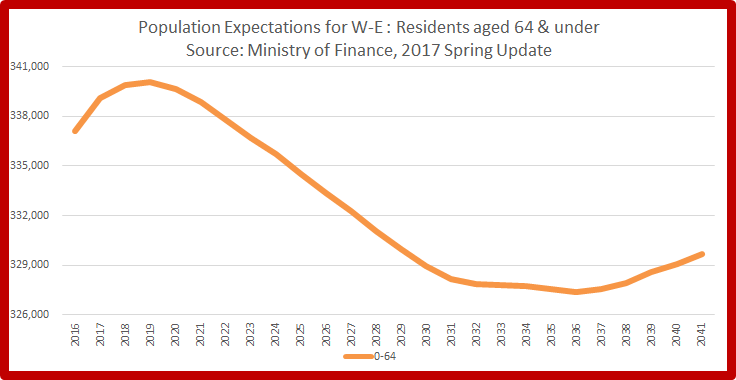 Those aged 50-64 will decline, by about 15% from the 2016 level predicted by the Ministry of Finance​. What's worrying about the decline in 50-64 year olds is that this age group is typically at the peak of its earning power, with less debt and more disposable income than those who are starting their careers. This will put pressure on the municipal tax base and on demand for larger family homes. Lapointe is the consulting firm that prepared the data in the City of Windsor’s 2008 report, Windsor-Essex and City of Windsor Population and Housing Projections. Its data only extends to 2031. The two graphs below illustrate the population data by age group through the next 15 years. They show some remarkable discrepancies when compared with the Ministry of Finance’s more recent projections. Note: The Lauzon Parkway Study doesn’t show a breakdown by age and is therefore not discussed below. 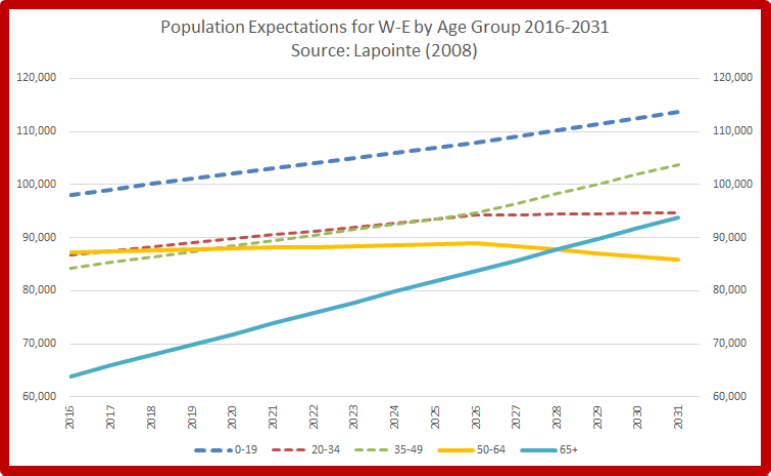 The Ministry predicts that seniors will be the largest group by far, while Lapointe's figures show that children will dominate. Where the Ministry sees downward trends in all three age groups under 50, Lapointe expects increases. The Ministry expects those older than 65 to overtake the 50-64 year olds in about 5 years from today, while Lapointe sees this happening a couple of years later. By 2031 there are 40k more seniors than their younger counterparts in the Ministry’s model, but this gap is less than 10k in Lapointe’s figures. The only thing the two data sources seem to agree on is that there will be fewer people aged 50-64. 131k seniors aged 65 and above, an increase of 61k. We can expect continued demand for accessible facilities and amenities catering to seniors, and smaller homes in higher density neighbourhoods. Of course people don't move to smaller homes on the day they turn 65, but many gradually downsize after their children leave home. Others stay in their family homes as they get older, and sometimes physical disabilities or financial constraints make it harder to keep up with the activities of daily living in a larger home, especially if they don't live in a walkable neighbourhood. This could put pressure on local demand for larger single family dwellings. If politicians base infrastructure development on outdated reports, they won't have the right information to make essential planning decisions. 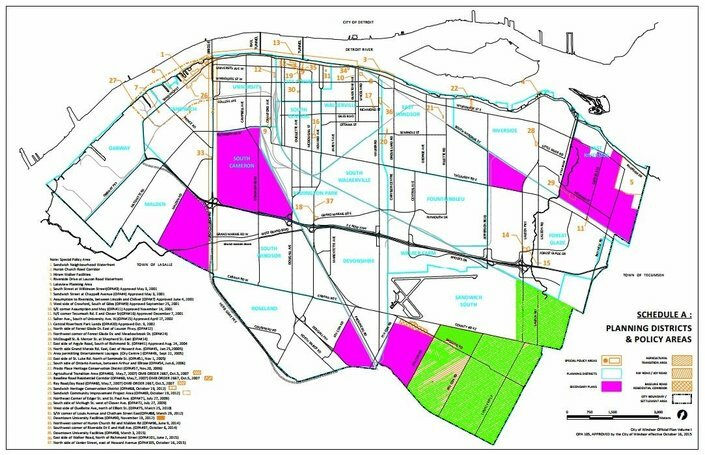 Windsor-Essex runs the risk of over-developing for its future needs. As regards Windsor specifically, we need to question any prevailing perceptions of a need to start developing the Sandwich South land in the next 25 years. Moving our hospital healthcare to a greenfield site far from all established neighbourhoods makes little sense given the aging of our population. Designing for seniors: More higher density housing for seniors in compact, walkable neighbourhoods will facilitate access to the amenities to help them with their activities of daily living, so they can age in place longer, and help them in their final years when healthcare needs increase and mobility decreases. More schools or more retiree facilities: Whether we expect more seniors or more young people has crucial consequences for the way we plan our future urban form. School closures will likely continue if there are fewer children. There may be opportunities to keep them functional by creating community hubs with amenities for seniors inside schools with excess capacity. Demand for low density homes: If our population of under 65's is shrinking, the need for continued low density home construction will fall as well. Where we're seeing bidding wars in the home resale market today, this could be driven partly by demand for income properties. It is likely to abate as more retirees downsize into smaller homes. Financial implications: A greater awareness of the financial implications of a significantly larger senior population on fixed incomes should help us anticipate future financial constraints on the public purse. It should also help us understand the detrimental consequences of continued urban sprawl development. Balanced Age Distribution: It would be constructive to question the wisdom of continuing to attract retirees to the region. Focusing on balancing the age distribution will be more beneficial in the long term. If you'd like to read more analysis like this, why not subscribe to our email service? We'll send you an email every other weekend. If you would like to receive weekly email updates, please subscribe to our mailing list here. We won't bombard you with emails and we certainly won't give your contact data to any other groups.